Cantor’s Driving School offers driving lessons and driver training in all areas of Scottsdale, Arizona. Over 50,000 drivers have learned to drive with Cantor’s Driving School. Are you our next safe driver in Scottsdale? 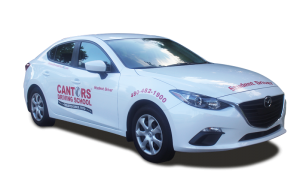 Cantor’s – The Driving School That Gets Results® in Scottsdale. When taking driving lessons in Scottsdale, Cantor’s Driving School provides driver training on main roads such as Price Fwy / AZ 101. Driving lessons can be conducted on local roads in Scottsdale like Thomas Rd, McDowell Rd, Camelback Rd, Hayden Rd, Granite Reef Rd, N Pima Rd, Shea Blvd, Cactus Blvd, and Frank Lloyd Wright Blvd. The Scottsdale areas covered include South Scottsdale, Central Scottsdale, North Scottsdale, McCormick Ranch, Gainey Ranch and Central City. Teen drivers can be picked up at any of the public or private schools in the Scottsdale area, including Scottsdale High School, Chaparral High School, Coronado High School, Desert Mountain High School, Saguaro High School, Notre Dame Preparatory High School, Rancho Solano Preparatory School, Salt River High School, Cactus Shadows High School, Bella Vista College Preparatory School, Horizon High School, Basis Scottsdale, Coronado High School, and Notre Dame Preparatory. Zip codes covered include: 85250, 85251, 85252, 85253, 85254, 85255, 85256, 85257, 85258, 85259, 85260, 85261, 85262, 85263, 85264, 85266, 85267, 85268, 85269, 85271. Cantor’s Driving School serves the Scottsdale Arizona area. To get started with driving lessons, call us at 480-482-1900 or use our convenient contact form.